When you hear the word “armor”, what images or feelings come to mind? Immediately I think of words like protection, battle and a feeling of anxiety. Each year I travel to Dallas, TX for our annual seminar for my career. Although many of our leaders may consider it a choice to attend, I made the commitment to the company many years ago to show up each year. The leaders in our company wear their level of distinction like that of the military. Each year a new suit is designed for the sales directors. Although there are different styles within the suit line, there is a common thread of being set apart. The founder of our company, Mary Kay Ash, thought it was important for our sales force to look impeccable. Perhaps you could call it our “armor”. When we think of armor, we automatically think about the physical protection it represents. A helmet, sword, breastplate, belt, steel-toed boots are some things that come to my mind. Have you considered your armor to be your values, priorities and way you choose to think? When you decide your course in life, it must be supported with a strong foundation. Life is more about decision managing than decision making. How do you manage in life? Life can feel like a battle and the armor we wear is key to survival. Have you ever noticed how people respond in airport when a group of armed forces walk through? They are physically dressed the same as well as mentally. Every time I wear my suit, I am reminded of my mission. Have you designed your mental suit? The pattern has a thread of love, hope, peace, forgiveness, gentleness, kindness and patience just to name a few. When you sow these threads into your mental suit, you are prepared to walk in the world and not be of it. In a 60 minutes interview with Marty Schafer, Mary Kay Ash was questioned about her using God in her business as part of her marketing strategy. How did she respond? “I sure hope not, I hope He is using me instead.” When you are grounded in who you are, what you believe and your choice of “armor”, you will be able to respond in a graceful and respectful manner. The picture posted in the blog today was taken at at our Seminar in Dallas, TX. 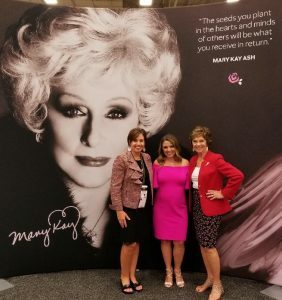 I am standing with Mary Kay Ash’s great granddaughter and my mother. Every time I look at at this picture, I am reminded of the mental armor of each woman. I challenge you to be intentional on creating your own armor. You get to choose how to battle in life. Choose well.